Irish Quality Food Awards and Great Taste Awards in 2015 were followed with further success in 2016 by becoming the first cider from Ireland to win a Trophy in the International Cider Challenge. This achievement was eclipsed a few weeks later by the results in the British Cider Championships held at the Royal Bath and West Show in Somerset, England. With over 600 ciders entered in what is recognised as the biggest cider competition in the world, Kilmegan Cider won the Dry category and went on to be crowned Reserve Supreme British Champion Cider for 2016. Each autumn, carefully selected varieties of apples from counties Down, Armagh and Tipperary are pressed using an old traditional Rack and Cloth press at the Cidery outside the seaside village of Dundrum, Co. Down. The juice from these apples is then fermented and matured for up to twelve months before bottling. Using 100% pure juice in our fermentation and sweetening process gives a natural clean and crisp finish to all our ciders. 500ml bottles Kilmegan “Real” Cider (Dry) 6.8% abv. Kilmegan “Irish Farmhouse” Cider (Medium Dry) 5.9% abv. Kilmegan “Wild Elderflower Infused” Cider (Medium) 4.0 % abv. Available in some of Northern Ireland’s best restaurants including; Shu Restaurant, Belfast. Poacher’s Pocket, Lisbane. Balloo House, Killinchy. Parson’s Nose, Hillsborough. Mourne Seafood, Dundrum. Maghera Inn, Newcastle. Buck’s Head Dundrum. Old School House Inn, Comber. Fontana and Coast restaurants in Holywood. Off sales outlets include: JN Wines Crossgar, Neill Wines, Groomsport. Barbican Wines, Newcastle. Donard Wines, Newcastle. Vineyard, Belfast. McMullan’s Ballynahinch. Bin34, Castlewellan. KWM Wine, Kilkeel. Mulholland’s, Castlewellan. Tom’s Wine Barrel, Downpatrick. Distributed by: Kilmegan Cider. 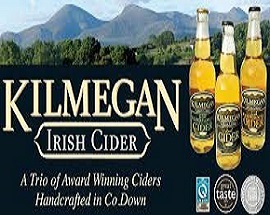 email; andrew@kilmegancider.com, JN Wine, Crossgar. email shop@jnwine.com, Neill Wine, Groomsport email info@neillwine.com.